The John Deere 7200 conservation planter I bought a week ago has a few minor problems and I've started working on them. 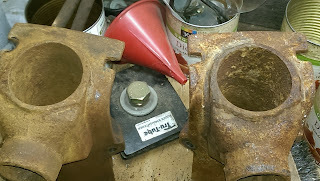 The fertilizer boxes have a metal auger and housings that were corroded by the caustic fertilizer used by the previous owner. 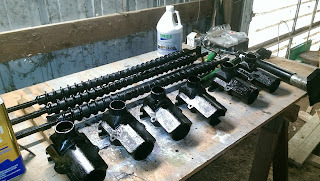 I won't be using the highly corrosive ammonium starter that conventional farmers use, though I will still use the fertilizer boxes to apply a much milder poultry manure next to the seed. For that I need to stop the "rot" by cleaning and repainting the affected metal parts. I'm putting in stainless steel fasteners where I can. Lots of scraping and grinding. Wire wheeling. After (on left) and before (right) cleaning. For the next step to work I just needed to get rid of any loose flakes. It was still a mess. There are 3 fertilizer boxes with a housing at each end and an auger that pushes fertilizer out each side, where it is dropped into a slit made by an opener ahead of each row. The layout in the bottom of each box is roughly as shown in the pic above. The auger is driven by a shaft connected via roller chains to the ground wheels. 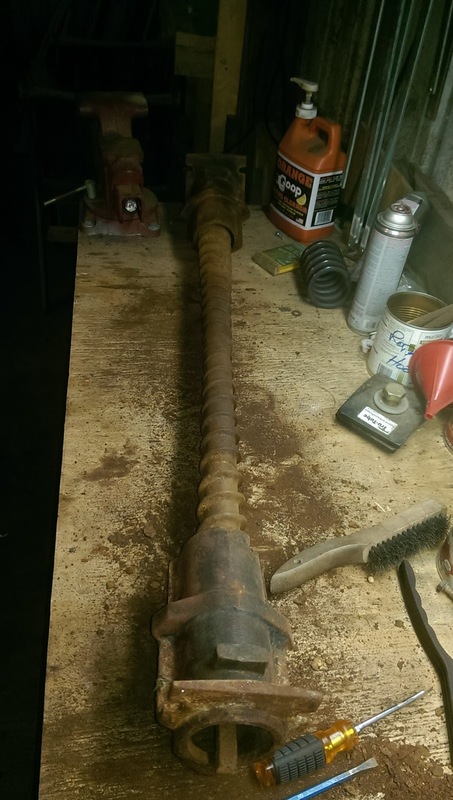 I used a product called Corroseal that converts the rust into an inert metal. To finish these off I'll put 2 coats of oil paint over them. 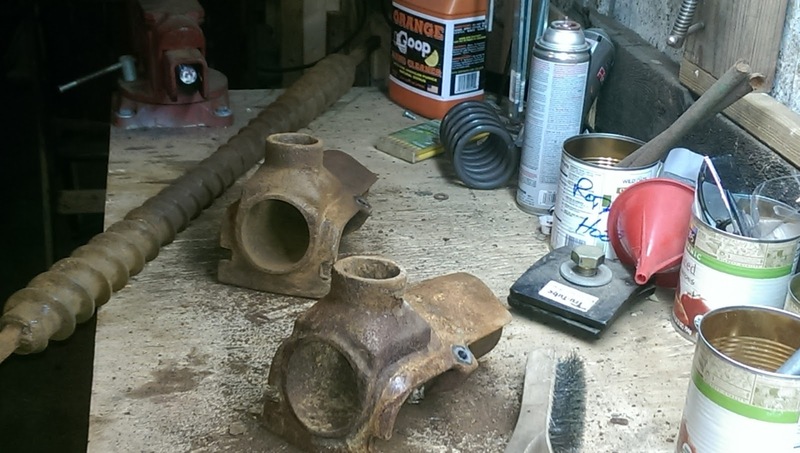 Rust, also known as Iron Oxide, is formed by a chemical reaction in which Iron oxidizes when in the presence of Oxygen and water or excessive moisture. Iron Oxide lacks many of the structural characteristics of the original Iron material and will continue to spread deeper into the material. If left alone, rust will almost always result in total failure of the panel or component affected. It should be noted that once Iron has been converted to Iron Oxide, it cannot be changed back. Thus, even if converted to a more stable compound as in the case of a rust converter, there will still be a permanent decrease in the physical properties of the component affected. Rust converters are designed to neutralize existing rust as well as prevent it from advancing its damage. The active ingredient in most rust converters is Tannin, in the form of tannic acid. This tannic acid combines with the Iron Oxide to form a more stable compound called Iron Tannate, which is typically black in color compared to the reddish color of rust. Many commercial rust converters will include both a polymer to act as a protective layer, and an additional acidic compound designed to accelerate the chemical processes related to the tannic acids. One such acid, known as Phosphoric acid may also work as a rust converter itself, by reacting with the Iron oxide and converting it to black ferric phosphate. 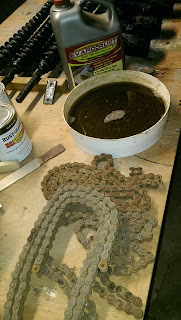 The drive (roller) chains - 16 for sure maybe more - are a little rusty so I'm cleaning them with "Evaporust". 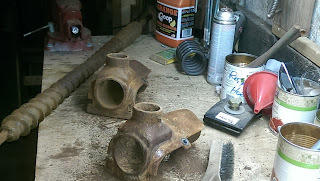 Next I'll put a coat of chain oil on them and reinstall them on the planter. I still need to hook up the planter to the hydraulics on the tractor and make sure the vacuum system, marking arms, seed monitor, and fertilizer auger are ok.
Once everything is working I'll put it in the shed so it's ready to go for next spring.